More than a year after 49 schools were closed by the Chicago Board of Education, taxpayers are still paying millions of dollars in utilities to heat and light the shuttered buildings, NBC5 Investigates has found. In fact, the utility bills are almost as much as they were when all of those school buildings were open. 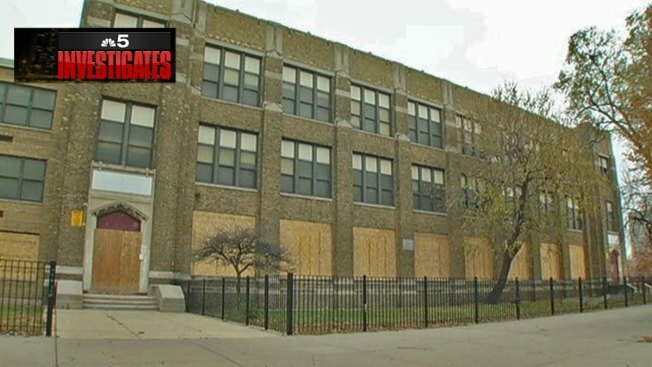 What’s more, NBC5 Investigates has obtained photos taken inside one of those vacant schools, showing extensive vandalism which – according to an internal Chicago Public Schools report – will add at least $12 million more onto the cost to refurbish or repurpose just that one building. From the moment the school-closings were announced in the spring of 2013, critics – including the Chicago Teachers Union – challenged the claims by CPS officials that the closings would free up hundreds of millions of dollars that could then be used to bolster surviving schools. NBC5 Investigates wanted to check on those claims, so in December of 2013 we filed a Freedom of Information request to look at one potential area of savings: Utility bills for the now empty buildings. We waited for months for information that was supposed to be provided within a couple of weeks. Ultimately NBC5 had to sue the Chicago Board of Education, and – just last month – we finally received a spreadsheet with the electric and gas bills for all of CPS’ vacant and surplus properties. It turns out that Chicago taxpayers paid more than $2.2 million throughout the 2013-2014 school year just to provide gas and electricity to dozens of vacant CPS buildings. That compares to the little more than $2.7 million taxpayers paid for those same buildings the previous school year when they were still open. Tom Tyrrell, CPS’ Chief Operating Officer, isn’t fazed by those numbers. "We’re spending money to maintain the buildings at a certain level, and I think that’s a rational and reasonable and responsible thing to do," he said, adding that some buildings remain lit and heated at the recommendation of the Chicago Police Department. Tyrrell pointed to CPS assessments, done before the schools were closed, which estimated how much it would cost to completely fix up and maintain each school over the next 10 years had it remained open. Factoring in staffing costs, he said those assessments prove that CPS is saving more than $43 million a year by shuttering those schools instead, even after allowing for the continued utility bills. But Jesse Sharkey, acting president of the CTU, takes issue with those numbers. "[CPS] used, essentially, made-up numbers," he said. "It said, 'We need $10 million in order to keep this school up for the next 10 years. We’re going to put a new roof on it; we’re going to do X, Y, and Z. '" Sharkey said that by simply not making all those long-term future improvements, CPS counted all that money as "savings." "It’s not real math," he said. "That’s why it was a problem in the first place to claim that you were going to be saving the entire cost of all the upkeep in the future," Sharkey contended. "You can’t claim that you save the $10 million that the roof would have cost, if anyone who comes along and buys the building is going to want that $10 million discounted off the purchase price of the building." "You can’t say, 'Well, you were never going to do that work.’ That’s not true. We do over $500 million a year in capital improvements," he said. In that perspective, he said the $43 million is actual savings and the $2 million utility bill is a defendable expense. Still, Tyrrell is clearly unhappy about the conditions at the now-shuttered Betsy Ross Elementary School in Chicago’s Washington Park neighborhood on the south side. NBC5 Investigates obtained more than 40 photos which reveal a disturbing amount of damage and vandalism throughout the school. "We had it all secured," Tyrrell said. :We had eyes on it. We made a number of arrests, but it doesn’t undo the damage that occurred." The building is now completely boarded up. To Sharkey, that’s a new problem in itself. "Now you essentially own a derelict property," he said. In fact, an internal CPS appraisal of the Ross building -- obtained by NBC5 Investigates in the aftermath of the vandalism – notes that, because of the new damage, "the building … requires extensive renovation and replacement to make it once again operational." So where the CPS’ pre-closing assessment said it would require a little more than $7.4 million to fix up everything at Ross for the next 10 years, the new appraisal raises that cost to anywhere from $18 million all the way up to $23 million now that the damage has been done. Even these increased costs of repairing a vandalized building don’t seem to worry Tyrrell. "If we can sell it 'as-is,' then it saves us from having to go back in and do a lot of work to a school to repair vandalism damage," he said. "If … a buyer is going to gut the building anyway …. They don’t really care if it’s been vandalized or not." But Sharkey counters: "We were told that schools would be safeguarded and they wouldn’t become eyesores, [and] that there wouldn’t be vandalism in these buildings. That’s been proven to be definitively not true." "The board had, really, a responsibility to look around the corner when it went to close these schools," Sharkey adds. "It had a responsibility to give us a truthful accounting of how much it cost to – to close a building." It’s expected that these issues will all come to a head about 18 months from now. That’s when Tyrrell said the CPS hopes to have resolved the fate of all the vacant school buildings, either by selling them, repurposing them, or tearing them down. That’s also when Sharkey hopes there will be hard and fast numbers to show how much was actually saved by closing down the 49 schools.